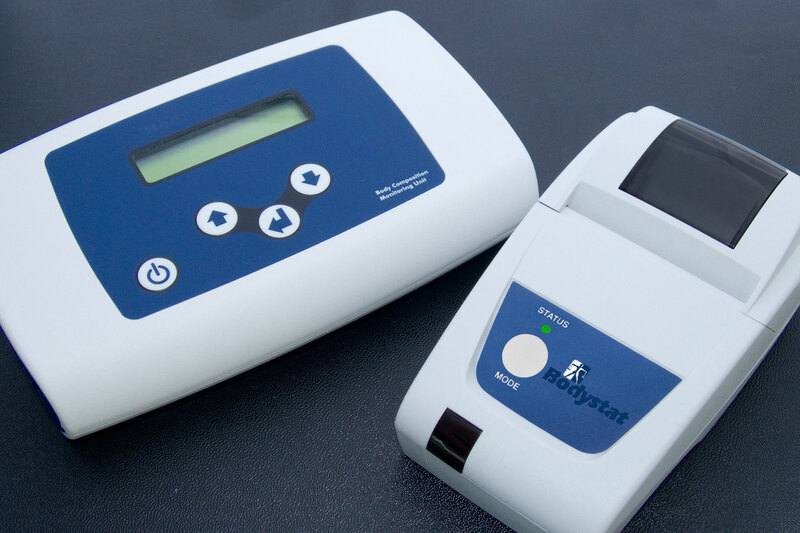 The Bodystat®1500MDD is a lightweight, hand-held, battery operated Bio-impedance Analyzer which is easy to use and requires no specialist skills. It is a non-invasive device, which measures the impedance value of the body providing quick and effective analysis of body composition. Whole Body analysis, rather than partial body analysis of arms or legs only, is measured for greater accuracy. The Bodystat®1500MDD has four main cable leads of which each lead has a crocodile/alligator clip. These clips are attached to the exposed tabs on the electrodes. The subject's Gender, Age, Height, Weight and Activity Level (optional) are entered using the three keypads. It works by passing a safe battery generated signal through the body and measuring the impedance at two frequencies of 5 kHz and 50 kHz. Once the test has been performed a complete body composition analysis is displayed on the LCD screen within five seconds comprising Body Fat, Lean Body Mass, Dry Lean Mass, Total Body Water and optimal ranges. Metabolic rates, waist/hip ratio, BMI. BFMI, FFMI, and a Wellness marker are also displayed on the LCD screen. Software runs on Windows-xp and Win-7. The Wellness Program is a basic program that focuses on education and is ideal for first time assessments on subjects. It has been specifically designed to enable a user to promote the entire concept of wellness. It provides specific information (up to 17 pages) on the body composition and health status of a subject. The body composition data is downloaded automatically from the Bodystat unit and other measurements (waist and hip, blood pressure, cholesterol, heart rate, aerobic capacity, flexibility, grip strength, lung function) can be keyed in. There is also space to allow the user to include their own comments. The Body Manager Program includes more powerful data management features and extended algorithms down to 6 years of age anf up to age 90. It is ideal for Health Clubs when a client returns to be tested in order to track their changes in body composition over a period of time. Trend Report - enables a user to track all measurements and impedance values over a period of time. Weight & Activity Manager - allows a user to develop a series of exercises in order to calculate the amount of kilocalories these will burn. This adjustment may then be incorporated into a user's own diet program. The number of weeks taken to achieve goal weight is automatically determined. Cardiac Risk Analysis - assessment of health status relating to lifestyle based on the largest study (The Framingham Study) of its kind in the world conducted in Massachusetts, USA. Factors include exercise levels, smoking, blood pressure, family history, etc. The software provides a perfect opportunity to expose the client to "What-if?" scenarios. For example "What if you reduce your smoking from 40 to 10 cigarettes a day?" The screen displays the effects of potential lifestyle changes like this, in a colourful informative way. This provides the subject with an immediate incentive to make the hypothetical improvements real, especially when they get the printed report. Alternative Equations - these are available for competitive athletes, children 6 years and over and geriatrics and may be selected as required by the user to determine % fat and lean muscle levels. Alternative metabolic formulae are also included and the user has the option to select their own % fat ranges. Click here to view the 4-frequency "Quadscan"
"Being involved in a practice which concentrates on preventative health, I have found Bodystat an invaluable tool in motivating the overweight patient, giving dietary advice to athletes and stressing the importance of healthy eating habits amongst business executives"
Dr. N.R. Grobbelaar Preventative Health Care Clinic, South Africa. 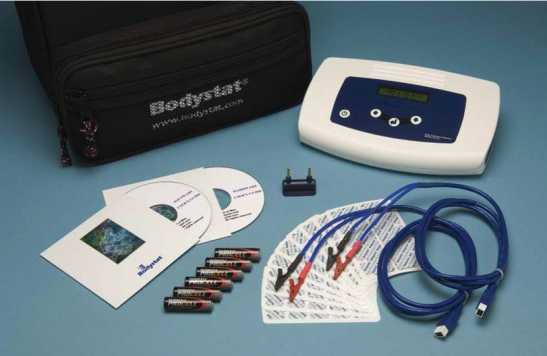 "The Bodystat machine is the best clinical tool I have probably ever had. We've done over 1600 tests now and give a print-out to each patient which gives them a new perspective on weight/fat reduction." "I wanted to tell you personally that I am very pleased with the way your product has been useful in my practice here at my clinics and with the awareness camps in the rural areas. It is simply superb. As a Bariatric physician I can say that I am much satisfied with it's usefulness in Bariatric practice in India." Dr. Kola Chris Vedanth, Bariatric Physician, SlenderTouch Obesity Control Clinics, India. "The Bodystat Body Composition analysis program has been doing extremely well - we have set up a Cardiac Risk Analysis program in conjunction and our employees are very appreciative. We have also found that our health promotion efforts are now more effective when our employees have something tangible and personalized."